Yes! Yes yes yes! We’re finally here! With this entry, we’ve reached 250 games, having covered one in four (game 1001 doesn’t count. We can write up Minesweeper from memory. Or another game like that. Maybe Reset Generation will turn out to be permanently lost. That’d be one less). An impressive accomplishment, even if I say so myself. We’re on track, we’re doing well and I’m still loving the challenge (as am I, but with a teaching job this is becoming more of a challenge than I signed up for two and a half years ago). As important to myself is that for this fifty, the final game pick is mine. For it, I decided on Fallout. There’s a few reasons. One is that we want to play it before Fallout 3 – perspective as much as anything. 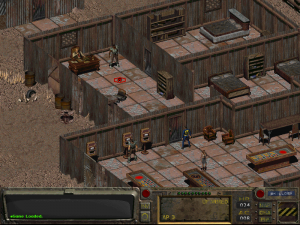 But also because the isometric RPG genre is one I’ve grown to love dearly and Fallout is one of the best examples of its kind. The next fifty will be games I haven’t played yet (while Peter’s will now be wide open). It’ll be a fun challenge, as I’ve enjoyed exploring the games I don’t know most in the past, but playing a game that defines my tastes best feels important now. So here we go. It’s difficult to give a proper critique of a game like this – a genre I love, a franchise I really like, but also one where the flaws feel obvious. First, while I know some will disagree, I feel Fallout 2 is a better game than its predecessor in just about every way. While a similar situation caused Baldur’s Gate II to be listed in favour of its first part (although its change in storytelling and design may have had an influence in this), here they went with the genre-defining first part. (Note that, for this comparison, I’m ignoring the more recent sequels, in particular Fallout 3. They are good games, but are different enough that we can’t make a real comparison. There are similarities, sure, but I can’t say much about it here). The comparison both gives an impression of where the game shines and where it is flawed, in particular where the sequel improves it. Aside from setting up an interesting world, the game does its best to make it feel alive. It takes a little while for this to become apparent – you start off in a rather boring cave and the first town you come across has little special going on. Changes happen, but it’s less obvious. It’s only partway through the game that you get to make any real choices. A lot of similar deepening content also requires backtracking. It makes the game less penetrable, though. The game starts off slowly – effectively a dungeon crawl with a previous town roughly pointing you in some other directions – that doesn’t show off the strengths of the game. You can go back to your home, but that’s only after 24 hours… and only if you bother going there. Of course, deviating from the original path is near-certain death, as you encounter tougher enemies. This too feels off, as in so many places the game allows multiple options. If anything, that’s one of the things the series prides itself on. Later in the game (and, in the sequel, starting in the tutorial) there are multiple options to take care of most situations, especially those involved in the storyline. Famously, you can talk the final boss to death, avoiding his flunkies by sneaking and lockpicking. It’s that sort of interaction that is interesting in this game. One of the most brilliant examples of this, by the way, is the changes you get when you play with a low intelligence. If it’s lower than three, you get a completely different set of conversation options. While a lot is blocked off, it makes for an interesting experience. One lesser thing that is fixed in the sequel are the companions. They are fun to have around and add a few bits in the game, but don’t level up with you and die rather easily. It’s a nice idea though. Character development is fairly advanced. While some deeper games followed, there are plenty ore options beyond how smart you are. As said, the skills you focus on matter, including violent or non-violent, but also the perks you get – small other bonuses. While some are straight forward stat bonuses, others are more interesting, such as Animal Friend or Flower Child (referencing that non-musical staple of the flower power era). In the end, though, it’s the style that makes the game. The design is based on the vision of the nuclear future of the 1950s. The cheerful, morally clean designs come through in the cuteness of the pipboy. There are plenty of browns. The Chinese and Russians are the enemies. It’s The Bomb that took it all out. Even the opening music – Maybe by The Ink Spots – feels part of the era. As a game, it kicked off a style of game that has been followed in Bioware’s games, Troika’s (when they were around), Obsidian’s and other, smaller companies. The game itself has its flaws, but aside from it leading to great other games, this is one of them for me. With the exception of French action-adventure Little Big AdventureI have personally had little experience with the isometric games before starting this blog. As someone more used to the top-down or 3D style gaming it is hard for me to access a game such as this. That, when coupled with the slow pace at the beginning, failed to make this game that interesting for me. What also did not help was that there is no personal history with this game and that I completed and loved Fallout 3 a few years ago.